Old friends are lost, cities destroyed one by one and Shuji struggles in fear with the knowledge of his girlfriend's terrifying powers. Chise fights on, defending the country from foreign invasion, but her humanity is rapidly succumbing to the deadly will of the weapon inside her. The young lovers attempt to change their fate, escaping to a small fishing port and finding ordinary jobs, but the military is close behind and desperate to keep their grip on the only chance for victory, their ultimate weapon... Chise. 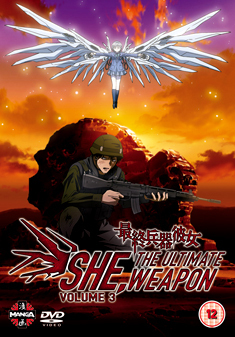 Contains the final episodes of the anime series (9-13).